After almost a year, the Lawrence, Kan., police department finally released video footage of a former officer shooting a motorist after an altercation between the motorist and another officer. In May 2018, driver Akira S. Lewis was pulled over by Officer Ian McCann in Lawrence for a seatbelt violation. Through the nearly eight-minute video (with very clear audio), Lewis is very upset for being pulled over for that minor violation, claiming to have seen many other white motorists guilty of the same thing, but somehow, he was the one stopped. The encounter escalates further when Officer McCann informs Lewis that he is going to jail for repeatedly failing to cooperate, at which point the officer calls for backup. Backup Officer Brindley Blood shows up and they both make attempts to get Lewis out of the car to be taken to jail. Things go from chaotic to bedlam as Lewis gets out of the vehicle and he and McCann get into a physical altercation, with Lewis getting the better of McCann, slamming him on the ground. Blood then pulls her gun and shoots Lewis in the back. According to Blood, she thought she was tasing him. 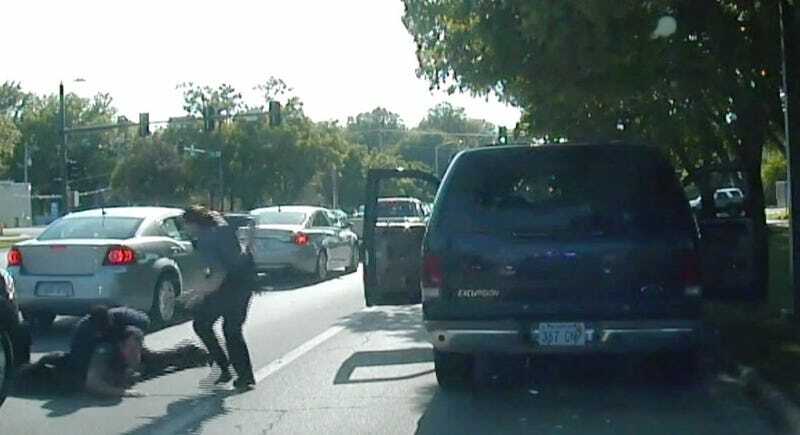 She is seen shooting Lewis when he punches and tackles the officer who initiated the traffic stop. Blood, who resigned from the police force in January after being placed on paid leave, is charged with aggravated battery. Lewis was treated at a hospital and is charged with several misdemeanors, including battery against a law enforcement officer. Blood, 36, is charged with aggravated battery, a felony, for allegedly recklessly hurting Lewis with a deadly weapon. Her attorneys argue that while Blood made a mistake she was not reckless and the charge should be dropped. After seeing the video and listening to other testimony Wednesday, Judge Peggy Kittel is weighing whether to bind Blood over for trial on the charge. Kittel is scheduled to announce her ruling later this week. For what it’s worth, Lewis was also charged in the May 2018 encounter with “with battery against a law enforcement officer, interference with law enforcement and driving without proof of insurance, all misdemeanors, and failure to wear a seat belt, a traffic infraction.” At the time of the stop, he was also dealing with several outstanding warrants, including in the jurisdiction where he was pulled over. Clearly, he wasn’t interested in having his license run, but the level to which this escalated seems excessive. How an officer can claim not to be reckless when she alleges she didn’t intend to shoot Lewis but did so anyway—when she thought she was pulling a taser—is beyond me. That sounds like the definition of reckless, especially given the video footage, because that looks like she knew exactly what she was doing. Judge Kittel will decide whether Blood will stand trial later this week.